Manchester City now stand nine points behind Premier League leaders Manchester United after they were held to a draw by Liverpool at the Etihad Stadium. Edin Dzeko gave Manchester City an early lead but a contested strike from Daniel Sturridge against his former club drew Liverpool level before the interval. City appealed for a foul on Dzeko then waited for Liverpool to put the ball out of play with the striker lying injured. Liverpool, as they were perfectly entitled to do since no whistle came, played on and Sturridge's finish carried too much power for Joe Hart. Steven Gerrard added to his catalogue of long-range strikes to give Liverpool a lead they deserved with 17 minutes left but Sergio Aguero's audacious strike from the tightest of angles as he battled with keeper Pepe Reina gave City a point. 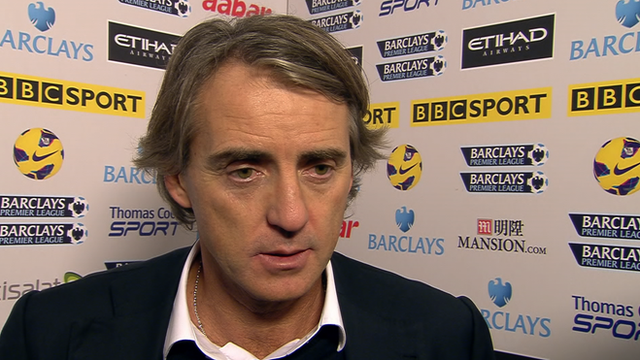 Manchester City manager Roberto Mancini could have no complaints about the result as Liverpool showed the greater endeavour and energy for long periods, and his side now face an increasingly difficult task to claw back United's lead and retain their title. City recovered a similar deficit to win the title last season but they are currently missing a vital spark which they must recover quickly to have any chance of closing that gap. Liverpool manager Brendan Rodgers will feel encouraged by his team's display but will once again be left cursing their inability to protect a lead, a failing that also cost them at Arsenal in midweek. Sturridge was the game's outstanding performer and shows signs of fulfilling all of his rich promise, but the other reality for Liverpool is that, as the calendar moves into February, they have yet to record a Premier League win against any team in the top half of the table. Rodgers had been impressed with Liverpool's performance at Arsenal despite surrendering a two-goal lead and made only one change, replacing youngster Andre Wisdom with Jose Enrique. Steven Gerrard remains the only midfielder/forward to play every minute of every Premier League game this season. Pepe Reina has made eight errors leading directly to goals in the Premier League since the start of last season. City's pass completion of 78% is the lowest they have recorded in a Premier League home game this season. The hosts, missing injured captain Vincent Kompany and both Kolo and Yaya Toure who are away at the Africa Cup of Nations, were almost ahead inside the first minute as Reina had to react well to turn over David Silva's effort. They took the lead after 23 minutes when Dzeko applied a simple finish to James Milner's low left-wing cross. But the visitors were level six minutes later in circumstances Manchester City clearly considered unsporting. They first appealed for a foul as Daniel Agger clashed with Dzeko then waited for Liverpool to put the ball out of play as the striker lay on the turf. They were frustrated on both counts - the more so when Sturridge took advantage of Javi Garcia's poor clearance to flash a 25-yard shot low past Hart. The Etihad expressed its displeasure but Liverpool were perfectly entitled to continue as referee Anthony Taylor chose not to stop play. It was also telling that Dzeko made a swift recovery once the goal had been scored. Liverpool ended the half on top as a breakdown in communication between Hart and Pablo Zabaleta ended with the defender sending an attempted backpass past the keeper and only inches wide. City were struggling for any rhythm or momentum and it was no surprise when Liverpool took the lead with 17 minutes left. They did so in spectacular style, Gerrard picking up the ball 25 yards out and, as he has done so often in his wonderful career, drilling a low, unstoppable shot into the bottom corner. If Gerrard's strike was a thing of beauty, Aguero matched it five minutes later. The Argentine won a race for possession with Reina outside the area before defying all logic to find the net from what looked an impossible position. Both sides almost grabbed the winning goal in the closing minutes, substitute Maicon heading just over for City and Hart clawing away another 20-yard effort from Sturridge. Full Time The final whistle goes and the game is over. Corner taken by Stewart Downing, save by Joe Hart. Unfair challenge on Joe Allen by Francisco Javi Garcia results in a free kick. Steven Gerrard restarts play with the free kick. Inswinging corner taken left-footed by Aleksandar Kolarov. Substitution Daniel Sturridge leaves the field to be replaced by Joe Allen. Stewart Downing fouled by Aleksandar Kolarov, the ref awards a free kick. Inswinging corner taken right-footed by Steven Gerrard from the left by-line, clearance made by Edin Dzeko. Shot by Daniel Sturridge from 20 yards. Save by Joe Hart. Foul by Gael Clichy on Glen Johnson, free kick awarded. Free kick taken by Glen Johnson. Aleksandar Kolarov takes a inswinging corner from the right by-line played to the near post, clearance by Stewart Downing. Inswinging corner taken left-footed by Aleksandar Kolarov from the right by-line to the near post, Steven Gerrard manages to make a clearance. Substitution Samir Nasri comes on in place of Gareth Barry. 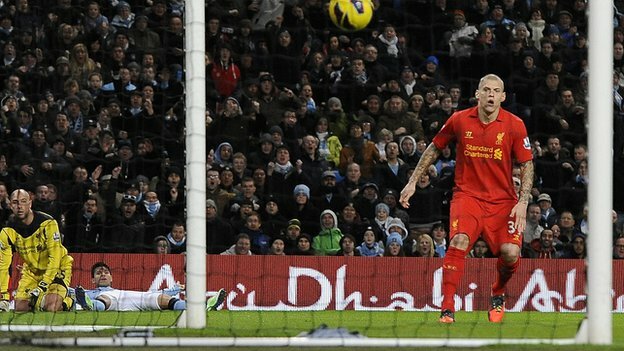 Corner taken by James Milner, Sisenando Maicon produces a header from deep inside the six-yard box that clears the bar. James Milner delivers the ball, clearance by Glen Johnson. Glen Johnson has an effort at goal from outside the penalty box which goes wide right of the target. Daniel Agger fouled by Sisenando Maicon, the ref awards a free kick. Daniel Agger takes the direct free kick. Steven Gerrard produces a drilled right-footed shot from 18 yards. Francisco Javi Garcia gets a block in. James Milner challenges Leiva Lucas unfairly and gives away a free kick. Steven Gerrard takes the direct free kick. Effort on goal by Daniel Agger from long range goes over the crossbar. Direct effort from the free kick comes in from Aleksandar Kolarov. Booking Steven Gerrard is given a yellow card. Steven Gerrard gives away a free kick for an unfair challenge on Sergio Aguero. Assist on the goal came from Gareth Barry. Goal! - Sergio Aguero - Man City 2 - 2 Liverpool Sergio Aguero finds the net with a goal from just inside the area to the bottom left corner of the goal. Man City 2-2 Liverpool. James Milner challenges Daniel Agger unfairly and gives away a free kick. Steven Gerrard sends in a cross, Daniel Sturridge has a headed effort at goal from deep inside the area missing to the right of the target. Substitution Martin Skrtel on for Sanchez Jose Enrique. Substitution Sisenando Maicon replaces David Silva. The assist for the goal came from Sanchez Jose Enrique. Goal! - Steven Gerrard - Man City 1 - 2 Liverpool Steven Gerrard fires in a goal from outside the penalty area to the bottom left corner of the goal. Man City 1-2 Liverpool. The ball is delivered by Sanchez Jose Enrique, clearance made by Pablo Zabaleta. Free kick taken by Steven Gerrard. Booking Francisco Javi Garcia receives a caution for unsporting behaviour. Free kick awarded for a foul by Francisco Javi Garcia on Luis Suarez. Stewart Downing produces a left-footed shot from the edge of the box and misses to the right of the target. A cross is delivered by Leiva Lucas, Gael Clichy makes a clearance. Headed effort from deep inside the penalty area by Gareth Barry goes harmlessly over the crossbar. Unfair challenge on Pablo Zabaleta by Luis Suarez results in a free kick. Francisco Javi Garcia restarts play with the free kick. Effort from deep inside the area by Luis Suarez misses to the right of the goal. James Milner sends in a cross, blocked by Glen Johnson. Inswinging corner taken by James Milner from the left by-line, Daniel Agger manages to make a clearance. Shot comes in from Aleksandar Kolarov from the free kick. Booking Jamie Carragher goes into the book. Jamie Carragher gives away a free kick for an unfair challenge on Sergio Aguero. Substitution Aleksandar Kolarov comes on in place of Matija Nastasic. Daniel Sturridge has an effort at goal. Blocked by Gael Clichy. Centre by Sanchez Jose Enrique. Direct free kick taken by Joe Hart. Booking Daniel Sturridge goes into the book. Jordan Henderson produces a cross, Header by Stewart Downing from deep inside the penalty area misses to the right of the target. Corner taken right-footed by Steven Gerrard, save by Joe Hart. A cross is delivered by Luis Suarez, clearance made by Joleon Lescott. Outswinging corner taken right-footed by Steven Gerrard, clearance made by Edin Dzeko. Steven Gerrard takes a shot. Blocked by Matija Nastasic. Inswinging corner taken from the right by-line by Stewart Downing. Francisco Javi Garcia gives away a free kick for an unfair challenge on Daniel Sturridge. Luis Suarez has a direct shot on goal from the free kick. Corner taken by James Milner from the left by-line, Francisco Javi Garcia produces a header from deep inside the six-yard box that clears the bar. Half Time The ref blows to end the first period. Luis Suarez takes a shot. Joe Hart makes a comfortable save. Corner taken by Jordan Henderson, save made by Joe Hart. Jamie Carragher challenges David Silva unfairly and gives away a free kick. Direct free kick taken by Gareth Barry. The referee gives a free kick against Sergio Aguero for handball. Free kick taken by Jose Reina. Inswinging corner taken by David Silva from the right by-line. Glen Johnson produces a cross. Direct free kick taken by Pablo Zabaleta. Booking Jordan Henderson goes into the referee's book for unsporting behaviour. James Milner fouled by Jordan Henderson, the ref awards a free kick. Sanchez Jose Enrique produces a cross, Joleon Lescott makes a clearance. Inswinging corner taken by Steven Gerrard from the left by-line. The referee gives a free kick against Daniel Sturridge for handball. Matija Nastasic restarts play with the free kick. Booking The referee books Edin Dzeko for dissent. Steven Gerrard provided the assist for the goal. Goal! - Daniel Sturridge - Man City 1 - 1 Liverpool Daniel Sturridge finds the back of the net with a goal from outside the penalty box to the bottom right corner of the goal. Man City 1-1 Liverpool. Jordan Henderson gives away a free kick for an unfair challenge on Gareth Barry. Gareth Barry takes the direct free kick. The official flags Stewart Downing offside. Joe Hart takes the indirect free kick. Daniel Sturridge fouled by Joleon Lescott, the ref awards a free kick. Stewart Downing sends in a cross, Jordan Henderson takes a shot. Assist on the goal came from James Milner. Goal! - Edin Dzeko - Man City 1 - 0 Liverpool Edin Dzeko grabs a goal from close range to the bottom right corner of the goal. Man City 1-0 Liverpool. Free kick awarded for a foul by Pablo Zabaleta on Jordan Henderson. Sanchez Jose Enrique restarts play with the free kick. Luis Suarez has an effort at goal from just inside the box that misses to the left of the goal. Glen Johnson takes a shot. Blocked by Joleon Lescott. Luis Suarez takes a shot. Jordan Henderson fouled by Francisco Javi Garcia, the ref awards a free kick. Leiva Lucas takes the direct free kick. Edin Dzeko is penalised for handball and concedes a free kick. Jose Reina takes the direct free kick. Inswinging corner taken left-footed by Stewart Downing, Daniel Agger takes a shot. The ball is crossed by Gael Clichy. Free kick awarded for an unfair challenge on David Silva by Glen Johnson. Free kick taken by Gael Clichy. Outswinging corner taken right-footed by Steven Gerrard from the right by-line, clearance made by Matija Nastasic. Effort from 20 yards by Steven Gerrard. Blocked by Joleon Lescott. Jordan Henderson decides to take the corner short. Daniel Sturridge takes a shot. Pablo Zabaleta gets a block in. Unfair challenge on Daniel Agger by Edin Dzeko results in a free kick. Sanchez Jose Enrique restarts play with the free kick. The ball is delivered by Sanchez Jose Enrique, clearance made by Gareth Barry. The ball is crossed by James Milner, Header from deep inside the penalty area by Francisco Javi Garcia goes harmlessly over the crossbar. Free kick awarded for an unfair challenge on Jordan Henderson by Pablo Zabaleta. Sanchez Jose Enrique takes the direct free kick. Foul by Matija Nastasic on Daniel Sturridge, free kick awarded. Sanchez Jose Enrique takes the direct free kick. The official flags Stewart Downing offside. Joe Hart takes the free kick. Inswinging corner taken from the right by-line by David Silva, clearance by Steven Gerrard. David Silva takes a shot. Jose Reina makes a save. 431. Actually I beg to differ on that one, I work in IT and it depends what the primary key is of the database table. You sign in with email address so more than likely that is the primary key so the nickname could be non-unique so you could have hundreds of Dave's if you wanted. To be fair, Dave is a united fan, i have seen him on multiple threads professing it. Also, there can't be multiple users with the same username, basic systems database knowledge would tell you that. The system in order for it to work properly and log people's posts, needs to be able to tell the difference between users. I.e. "Dave" would be different to "dave". That said, so what ? What a funny argument to have come across. Dave, you have lied. Even in an earlier post, you admit to quite liking United. To end this debate, Svennis wins. So who are you supporting this weekend when the toffees play the mancs? Conflict of interest. Dave - you asked for proof - I have provided it. Usernames are unique. Both threads show your username. The QPR thread, which at least you admit to posting in, is actually the one where you are caught lying as proven by the three posts 211, 237 and 246. Why on earth are you still protesting in the face of all this evidence? You're not Chris Huhne are you?